A Knights of Columbus council wrote an open letter to Democratic Sens. 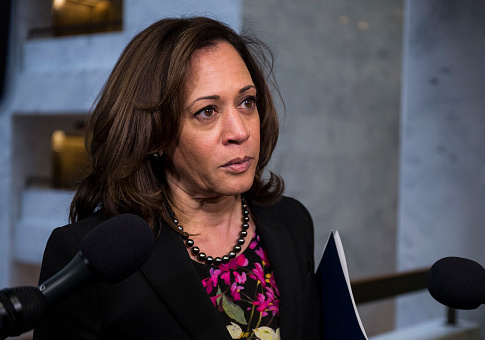 Kamala Harris (Calif.) and Mazie Hirano (Hawaii) after the Senate Judiciary Committee members questioned district court nominee Brian C. Buescher in December about his affiliation with the Catholic men’s group. "The Knights of Columbus in general, and O’Boyle Council in particular are dedicated to the three fundamental principles of charity, unity, and fraternity," wrote the Patrick Cardinal O'Boyle Council, which is based in Washington, D.C. Both Harris and Hirano took issue with the Knights in their written questions, submitted Dec. 5, directed to Buescher. Harris described the group's designation as "an all-male society" and asked Buescher whether he was aware of the group’s positions opposing "a woman’s right to choose" and "marriage equality." Hirano called the Knights "extreme" in their views on marriage and asked whether, if confirmed, Buescher would resign from the group "to avoid any appearance of bias." The nominee answered that he would not make rulings based on the Knights’ political views, stating that the organization "does not have the authority to take personal political positions on behalf of all of its approximately two million members." The O’Boyle Council’s letter expanded on Buescher’s comments, outlining for Harris and Hirano the Knights’ local activities around the Senate offices over the past few months. The council has worked with Catholic churches on Capitol Hill to raise over $4,000 in funds for coats for underprivileged children in the neighborhood. It has also collected diapers and other baby supplies for mothers in need, as well as donating an ultrasound machine to a local health clinic. "We hope this list of activities help to assure you that we are simply a group aiming to do God’s work while building friendships," the council wrote. President Donald Trump nominated Buescher to serve on the U.S. District Court for the District of Nebraska on Nov. 3. The council, one of thousands across the country, concluded by inviting Harris and Hirano to support its ongoing charitable work by joining the group for an upcoming event, the annual Polar Plunge, to raise funds for the local Special Olympics program. This entry was posted in Politics and tagged Catholic Church, Kamala Harris, Mazie Hirono. Bookmark the permalink.